We’re heading into summer, and it may well be a scorcher this year. Now’s a good time to look at home improvements that can help save energy and make your house more comfortable in those hot, sticky months ahead. Air conditioning installers in Miami and other hot, humid climates are going to be very busy this summer. How can you get the most from your investment in air conditioning? 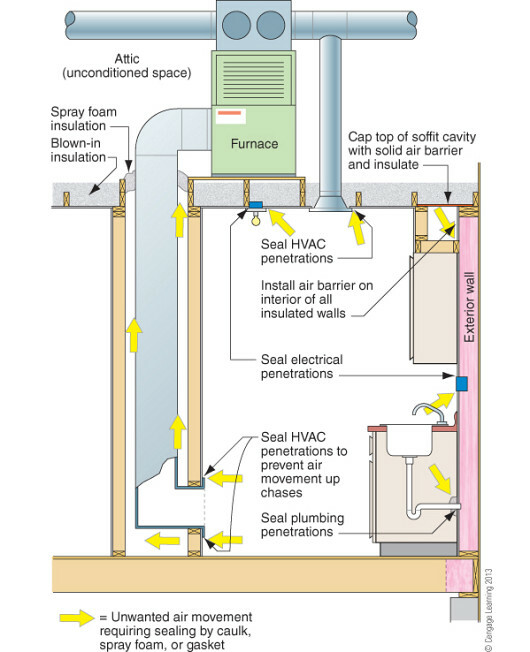 The first thing that homeowners and contractors need to understand is that air sealing is really important. The most common insulation, fiberglass, doesn’t work very well when air leaks through it. It’s actually a pretty good filter for dirt (you may have noticed that it’s used for those cheap furnace filters), when you cut open an old insulated wall you usually see big streaks of dirt where air has been blowing through the insulation for years. Not only do air leaks keep the insulation from working, they let lots of humid air into the house, making your air conditioner work harder. Tightening up those leaks keeps your home more comfortable, lowers the humidity, and saves lots of energy in the process. So where do we need to air seal, you might ask? Pretty much everywhere, but let’s start at the bottom. For now, I’ll assume you have a wood framed floor with a vented crawlspace below, and probably fiberglass batt insulation installed between the floor joists. Carefully pull out the batts around any big holes like tub drains, pipes, big wires, and any other place where there are holes in the floor decking. Plug those holes with foam boards, spray foam, or anything else that won’t let air pass through. Don’t jam fiberglass insulation in the holes - it won’t air seal anything. Then carefully caulk all the small holes where wires and pipes pass through the floor. Then go inside and caulk all the cracks between the walls and the floor. If you’re replacing carpet or refinishing wood floors, put a good bead of caulk or spray foam between the baseboard and the subfloor. Next, start moving up the walls, filling all the gaps in the drywall – around receptacles, pipes, wires, window and door trim, and anything else that makes a hole in the wall finish. You can buy foam gaskets to put behind electrical plates and help seal them from more air leaks. If you have any knee walls (walls between interior space and attics), make sure they are well insulated and have a solid air barrier on the attic side – something like drywall or foam board, carefully caulked at all joints and edges. Without this, all the heat from the attic will flow right through the insulation into the rooms below, making them really uncomfortable. Last, we need to fix up the ceiling. This is where we usually get the most air leakage, particularly in the summer. Go up in your attic and start pulling the insulation away from the walls, pipes, wires, and any other openings in the ceiling. Seal those holes the same way you did the ones in the floor, making sure that you get them all. You should also seal the crack between drywall and the wood wall at the top – a big air leak in most houses. But the biggest ceiling leak is the attic stair or access hatch. You can build or buy a nice foam box to seal over the top of them, but you have to be careful about putting it back every time you go into the attic. Not interested in taking on this project yourself? Think about hiring a weatherization contractor to inspect the house and make the repairs for you. If you’re lucky, your local utility may offer rebates for doing improvements like these – you can be more comfortable, save energy, and get a little money back in your pocket.